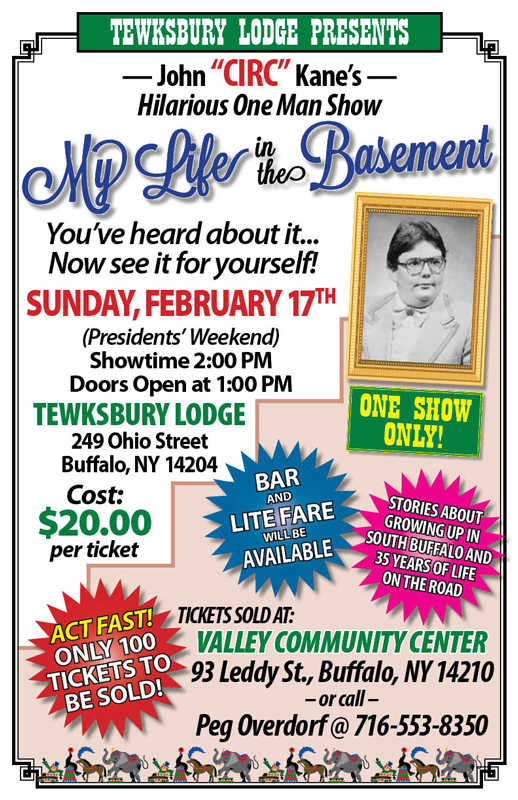 On Sunday, 17 February 2019 at 2:00pm, John “Circ” Kane for his one man show – “My Life in the Basement” which includes stories about growing up in South Buffalo and his 35 years of life on the road! Tickets are just $20 and only 100 tickets to the event will be sold. Doors will open at 1pm with the show starting at 2pm. Drinks and lite fare will be available for purchase. For Kane, who grew up in South Buffalo during the 1970s, the obvious answer was “Be a clown!” Literally. He did shows for imaginary audiences in his basement, while his father communicated to him through the ventilation duct, before embarking on forays into clowning, fire-eating, and finally, became ringmaster for the Big Apple Circus at Lincoln Center in New York City—really!